Welcome to Ultimate Hog Hunting, a online Hog Hunting resource. We are a comprehensive Hog Hunting website directory of guides, outfitters and lodges. Oak Stone Outfitters offers fully guided and outfitted hunts on private ranches for wild pigs in the central coast area of California. Pig hunts are conducted 15-25 minutes from Paso Robles, CA. Hunters can expect to see 20-40 pigs per day or more depending on the time of year. Spot and stalk methods are used as well as ground blinds when hunting archery. Most pigs taken have an average weight of 160 lbs with a few taken every year that exceed 300 lbs. 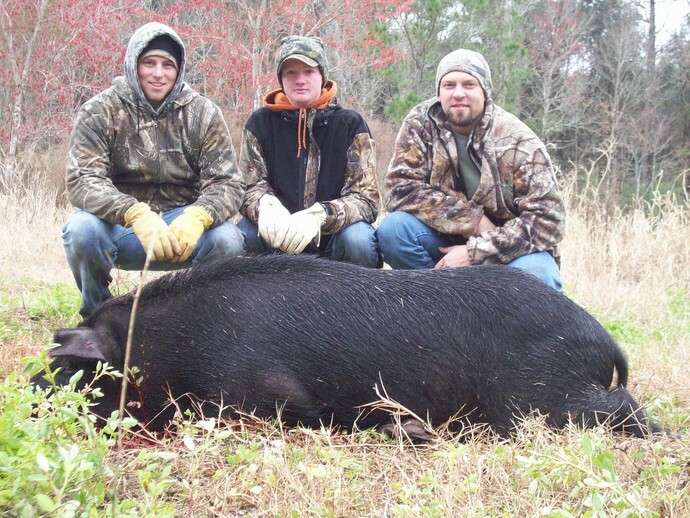 Florida wild hog hunting is one of the most exciting hunts a person can experience. It's an adrenaline rush when the dogs have a huge wild boar bayed up and you have to go in and catch the hog alive. From shooting, stabbing, or even spearing it, who wouldn?t want to experience a once in a lifetime opportunity like this one? We have been known to have the biggest hogs in North Florida! We provide all of the equipment including semi automatic weapon systems with state of the art thermal imaging optics, ammo, and shooting sticks included in the price of the hunt. We hunt over 30,000 thousand acres of prime feral hog habitat across North, North East and South Texas. including the counties of Fannin, Lamar, Grayson, Navarro These hunts are guaranteed opportunity to harvest or no charge will be incurred to the clients! Visit our premium Hog Hunting outfitters, guides, and lodges to plan your next Hog Hunting trip.